Hi everyone! I've been a bit quiet for the past few weeks and haven't posted workout recaps, and that's because Dan and I took a quick trip down to Florida! We were there for 10 days and visited Miami and the Tampa area and crossed off two more stadiums. Here's a quick recap of the trip, along with some workouts I managed to squeeze in! We stayed in Brickell, which was a GREAT location. There were a lot of restaurants and beautiful places to run, and anytime we drove somewhere we were going against the crazy Miami traffic. For my speed work, I ran to Brickell Key, which is a flat, mile long triangle island. It has beautiful views of the skyline and even has some water fountains! Plan was to do 1 mile warm up and cool down, then 1 mile at 8:30, 1 mile of 8:10, rest 3 minutes and repeat. After the first round (hitting the paces perfectly) I was completely wiped and my legs felt like lead, so I just ran back to my hotel until I hit 4 miles. 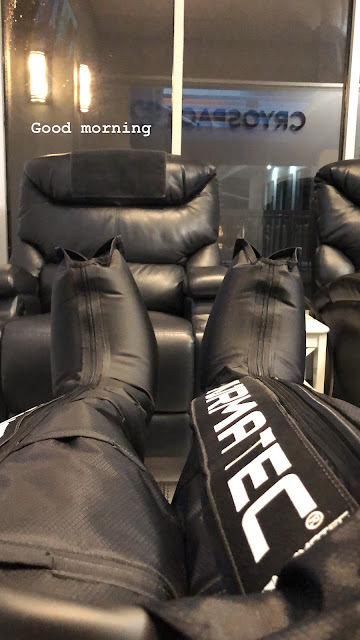 I noticed a sports recovery placed called CryoSpace in ClassPass near my hotel, so I decided to give compression therapy a try for the first time. I sat in a comfy chair for 30 minutes with big leg sleeves on that squeezed different parts of my legs. It felt great! This was the third tennis tournament that I went to (Cincinnati Open and Rogers Cup being the others), and I would say this has been my favorite. The event was held in a new location this year and the main court was in the Dolphin's Stadium. The entire tennis campus was beautiful, with lots of fun restaurants and places to watch the game while relaxing in the shade. We were most excited to see Roger Federer play (he pulled out of the other two tournaments when we went), but unfortunately he had a rain delay and got moved to the next day. Luckily for us, the Miami Open offered everyone tickets for the day session so we got to come back and see him play! It was awesome!! I really wanted to make a trip to the National Park while we were there, and a friend suggested we rent bikes at Shark Valley! Not only is it really convenient when driving from Miami, but it's also a beautiful area. The bike trail is a flat 15 mile loop, with an observatory tour at the halfway point. We saw so many alligators and interesting birds! I took another ClassPass class near my hotel that Evelyn was teaching. It was intervals of different strength moves, using all kinds of equipment (dumbbells, kettlebells, sand bags, plates, slam balls). We also got to run outside and do burpees, so it was a great full body workout. What a cool area! You can tell that you've arrived to Wynwood by the brightly painted buildings and art surrounding you (even our parking garage looked like it could be an art piece). We made a few different stops while we were there- the Wynwood Walls, Panther Coffee, Salty Donut (best donut EVER- I got the chocolate hazelnut), Wynwood Brewing, and Concrete Beach Brewing. Crossed another stadium off our list (lucky #10)! We were at the game for Opening Day which was so much fun, but in general I found the stadium a bit bland and nothing that will stick in my mind. The roof was also closed since it was raining (which was GREAT to not get rained on!) but it made the atmosphere much different than a traditional game! We spent our final full day in Miami driving down to the Keys! It was such a beautiful drive- surrounded by crystal clear water and driving through lots of cute towns. We made it down to Marathon, making lots of stops along the way, and next time I want to go all the way to Key West and stay for a night or two! My favorite stop was at Long Key State Park, which has hiking trails, picnic areas, and beautiful beaches. After making a visit with my grandparents, we made our way to the west coast and Clearwater Beach! I was actually here for a bowl game in college, so I was excited to be back. We stayed at the Hyatt Regency, which was right in the center of the island and had a beautiful view of the beach. Unfortunately it rained most of the time we were there, but I managed to run the entire distance of the island for a run! Our final day of the trip was spent in the St. Petersburg area, where we crossed off a ton of breweries and made it to another stadium. My favorite brewery of the entire trip (and maybe ever) was 3 Daughters Brewing, which had a fantastic atmosphere, was really large, and had a huge selection of beers, ciders, wine, and hard seltzers. I'm trying to convince them to have a second location in Pittsburgh! At the game, Dan caught a foul ball which was the highlight of the visit for me! Do you like active vacations or relaxing ones?